Napa Valley can be found about an hour north of San Francisco, California. This scenic countryside is where you will find lush vineyards, incredible wineries, fine dining restaurants and luxury accommodations. The famous vineyards of Napa Valley are the top producers of wine in the United States, and many of the world’s finest wines come from these fertile lands. A truly memorable way to see the beautiful Napa Valley and its rich, wine making history … is by taking the Napa Valley Wine Train. It’s definitely one of the most popular and “must-do” activities in Napa’s wine country. The Napa Valley Wine Train offers a unique wine country travel experience offering a picturesque view of the peaceful Napa countryside. Wine Train passengers will enjoy a leisurely, three-hour journey from Napa to St. Helena and back, traveling through the towns of Yountvile, Oakville, and Rutherford. This 36 mile round-trip journey is simply not just a train ride, but also an unforgettable, culinary experience. It’s the perfect combination of terrific food and fine wine from Napa Valley. Your journey begins the moment you climb aboard the train. The restored vintage rail cars are an amazing site and consist of a combination of 1915-17 Pullman dining cars and lounge cars, plus a 1952 Pullman Vista Dome car. It actually feels like you’re going back in time, as these historic cars have been restored to their original beauty. – A 3-course gourmet meal that is prepared on-board in an adjacent kitchen car, next to each dining area. – For a more private dining experience, enjoy your 4-course meal in the Vista Dome Car, which provides an elevated observation view of the Napa wine country. The dining car has been meticulously refurbished using elegant Honduran Mahogany paneling and luxurious brass accents. Extend your experience by booking one of four different, well-known winery tours, with your choice of visiting – Raymond Vineyards, ZD Winery, Domaine Chandon Winery, Grgich Hills Estate or the Raymond Family Vineyards. 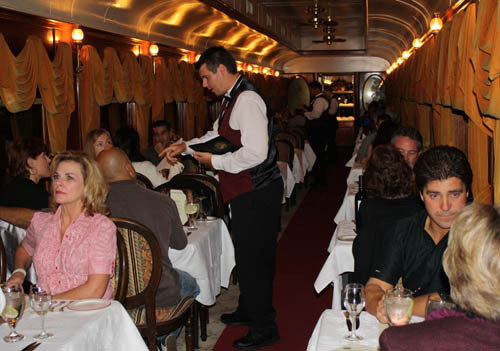 – Enjoy a 4-course gourmet meal while you enjoy an amazing evening via an antique train. – A 5-course gourmet meal is the ultimate fine dining experience and one I personally had the pleasure of experiencing. Our fabulous 5-course meal started with a plate of incredible Hors D’Oeuvres consisting of seasonal vegetables, cheeses and finely cut meats. Next was delicious baby lettuce salad with candied walnuts and smoked goat cheese in a honey cider. Following was a tasty Harlequin Sorbet made of the perfect blend of the Wine Train’s very own Sorbets. For the main entrée, we had the choice of Grilled Lamp Chop, Achiote Pork Tenderloin, Sweet Pea Ravioli with Roasted Peppers, or Swordfish. A lover of seafood, I decided to go with the Swordfish, which was prepared and served to perfection! There was an incredible list of wine to choose from. We decided to try a bottle of white wine. Our server suggested a 2008 ZD Wines Reserve Chardonnay. An excellent choice and superb tasting wine! After our dinner was complete, we moved to the dessert car and had a difficult choice between Creme Brulee and Chocolate Tiramisu. My wife chose the former and I, the latter. After sampling both, they were equally decadent. It was the perfect way to end an exquisite meal – sitting in plush swivel chairs while gazing out the large windows at the passing Napa Valley scenery. 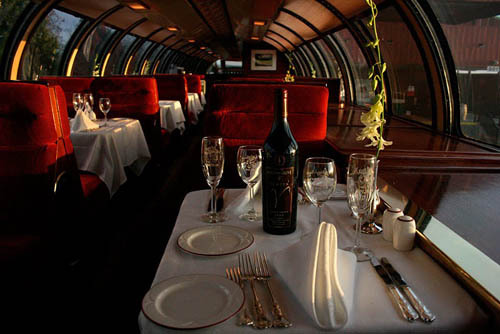 The Napa Valley Wine Train also offers its own wine tasting bar. Stop by and sample a wide variety of boutique wines from many of the local Napa wineries. Be sure to plan ahead and make your reservations early as the Napa Valley Wine Train is very popular, especially during the busy summer months. 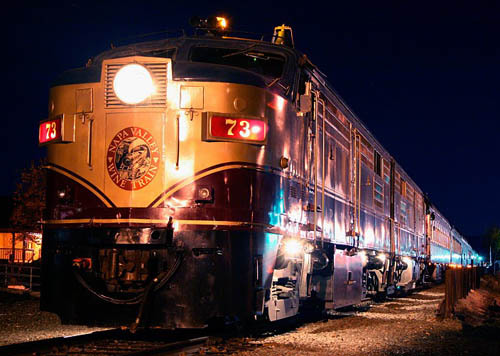 The Napa Valley Wine Train is a once-in-a-lifetime experience that everyone should enjoy. It simply is the ideal way to enjoy fine wine, a gourmet meal, and take in the breathtaking Napa Valley scenery in a historic, yet elegant train.